By now, most people have gotten used to the idea that Twitter becomes a kind of real-time newswire during events like Hurricane Sandy: a never-ending stream of news reports and photos, thanks in part to services like Instagram, and for some people at least a crucial lifeline of information during power outages. Can you believe everything you read during such an event? Clearly not, since there were innumerable false reports and fake photos circulating on Monday night. But what’s interesting isn’t that there was fake news — it’s how quickly those fakes were exposed and debunked, not just by Twitter users themselves but by an emerging ecosystem of blogs and social networks working together. In the not-so-distant past, CNN would have been the first place most people went for information about an event like Sandy, since it more or less invented real-time news for the television age. But if Twitter was criticized for distributing fake news reports, CNN didn’t get away scot free on that front either: the news channel reported Monday night that the New York Stock Exchange was under three feet of water, but later had to retract that information when video evidence from the NYSE showed no water at all. It turned out that CNN had reported something that was mentioned in a National Weather Service discussion forum, without checking to see whether it was actually true. In many cases, coverage from CNN and other news channels amounted to reading reports from Twitter, and interviewing their own news reporters standing hip-deep in the water in places like Atlantic City or Battery Park. Meanwhile, Instagram was providing a much more effective real-time visual feed of the damage caused by the hurricane — thanks in part to some innovative tools like Instacane, which pulled in photos of the storm automatically (the site was originally created to do the same thing during Hurricane Irene last year). Within minutes of a power substation exploding in Manhattan, the video was available on YouTube and was circulating through Twitter, as were other compelling scenes. Not surprisingly, many of the photos being shared the most were fakes — some of which, like the shark swimming down what someone claimed was a street in New Jersey, were just being re-used from the last hurricane with a different name. But at the same time, Twitter users and journalists at several news outlets were busy sorting out what was real and what wasn’t, using their social networks as a crowdsourcing tool. Alexis Madrigal and his team at The Atlantic, for example, quickly set up a blog Monday night to try and separate fact from fiction as far as the photos of Sandy’s damage were concerned — a blog that Madrigal called a “Insta-Snopes,” as a tribute to the veteran rumor-debunking site Snopes.com. For each photo, the team tried to find the original source, or at least enough information about the shot to determine whether it was real or fake. 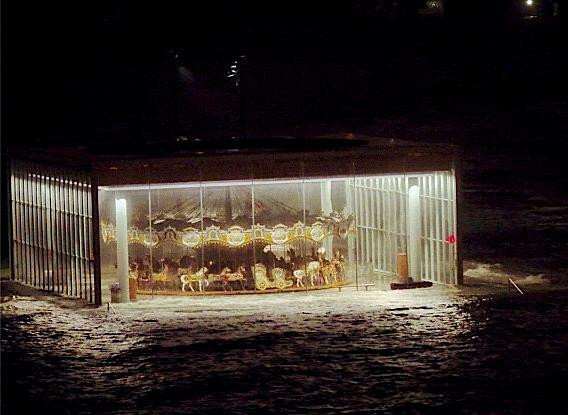 In some cases, like the stranded carousel in Dumbo, the picture seemed almost too good to be true and yet turned out to be real. And the site put large “real” and “fake” logos on each, so that if they were shared it would be obvious what they were. Meanwhile, others were doing fundamentally the same thing in different ways: Katie Rogers and a team from The Guardian — which has built a big part of its business on the concept of “open journalism” — were using Storify to aggregate and curate photos and debunk fakes, and a Tumblr blog called “Is Twitter Wrong?” was also working hard to separate fact from fiction. As John Hermann of BuzzFeed pointed out in a post on his Tumblr blog (since BuzzFeed was still down due to the power outage), it’s easy to focus on the fake news that gets circulated on Twitter during such events, but there is just as much reason to be optimistic about the speed with which it gets corrected. Some of those who saw the original fake report may not see the correction — and Craig Silverman of Regret The Error has noted that the original tweet often travels much farther than any subsequent update — but the fact is that it occurs, and often faster than mainstream news gets corrected. In some cases, that involves individuals like Andy Carvin of NPR, who pioneered the use of Twitter as a kind of crowdsourced newsroom during the Arab Spring; it also involves new services like Storyful, which does real-time verification of videos for both mainstream media outlets and news consumers in general. And then there are players like The Atlantic and The Guardian, which make use of their skills to do their own real-time fact-checking — and hybrid services like the BBC’s “user-generated content” desk, which tries to verify photos and reports from social media. As I’ve tried to argue before, the point is not that Twitter or Facebook or social networks in general are replacing mainstream media or mainstream journalism, but that the ecosystem of news is expanding to include a wide range of other sources — including “citizen” journalism. Smart news outlets are trying to make use of these new tools to expand what they do, and events like Hurricane Sandy are a great example of what can happen when that process starts to work in real-time. Social media really affects the information that the mind of the follower. It is the best source in reaching out the focus of people. That’s why every information should be factual and mostly before the viewers have that information in hand make sure that the source is reliable. It seems fairly easy to set up a census to ask if the respondent has seen some of the photos (the dark cloud over the Statue of Liberty, and the carrousel, e.g.) and whether they know if they are real, dated, or shopped, or even if the photographer was a professional. Then, comparing answers from people who regularly watch TV vs. those who regularly follow twitter, youâ€™d have a valid estimation of how much twitter heals itself. to keep it a short survey. With a reasonable audience of 10k, youâ€™d have significant results. Not sure how to reach TV viewers, or how to encourage a vaguely representative sample (probably Mechanical Turkers to have an international audience) but â€”apart from having no audienceâ€” anyone could set that up easily. Twitter is at its best in an emergency. Unfortunately it is also the river that carries much everyday misinformation that appeals to people’s baser instincts, for example. Mark Kelley’s debate example is a good one. Yes, there was rich commentary, but there was a tremendous amount of noise and disinformation being planted there. So let’s ask ourselves whether it was a good idea for CNN to be trolling forums and Twitter for news to report, or whether having bodies monitoring scanners would have been a better use of their resources. I listened to the FDNY radio scanner(s) last night when I finally tired of watching Ali Velshi standing in pools of standing water when dry sidewalk was right behind him. As a long-standing Twitter fan, I’m tiring of the constant need to “self-clean” the garbage that flows through there. We need actual journalists in the field, on the scanners, and on the screen instead of people monitoring and filtering Internet disinformation. Anybody that watched the debates with twitter on hand had a much richer experience (depending on who they were following) that added a lot of what could be called “crowd sourced color commentary”. Twitter, like Wikipedia (another self-cleaning over) can quickly bring true subject matter experts, it not simply eye witnesses – to any newsworthy story quickly.